A catastrophic injury can mean the end of full function for you. They have not only physical effects, but can have emotional and financial effects as well, because it is a permanent injury that will dictate a need for continued care. If your loved one has been seriously injured, it can cause financial and emotional burdens that can be stressful, not only on the victim, but also the entire family. Contact Williams & Thorson, LLP to discuss your situation and to discuss receiving compensation for your medical bills and other losses that you are experiencing. Many different injuries fall into the category of a catastrophic injury. From spinal cord injuries to traumatic brain injuries (TBI) to burn injuries and more, if it leaves permanent damage, it can be considered one of these types of injury. If the injury was due to negligence, you deserve to be compensated for the medical care, as well as the loss of function, wages, and pain and suffering. The causes of catastrophic injuries are many. From a car crash to a sports accident to a work accident to a slip & fall, legal options are available to get the victim the support that is needed to continue to care for your loved one. The enormous impact of a permanent injury not only causes the immediate physical injury that occurs, it can have an affect upon quality of life for the victim, and can be emotionally difficult for all involved. Financial compensation for your injury and loss of function is a right and Williams & Thorson, LLP will ensure that your right is preserved and executed. Not only are your medical bills compensated for, but you can also be compensated for such damages as loss of quality of life, current and future wages, pain and suffering, mental anguish, permanent disability costs, future medical costs, and the cost of rehabilitation and therapy services. Any kind of injury is difficult to overcome and to live with, but if your family member is facing a permanent injury that will leave them unable to care for themselves, you deserve to be financially compensated. While this will not make up for the catastrophic injury and loss of quality life for your loved one and the rest of your family, it can take some of the stress off of your shoulders and allow you to focus on the care. 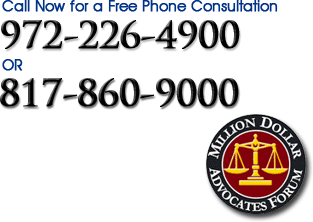 Call (972) 226-4900 or (817) 860-9000 to discuss your case.